Part of the Seeing Eye dog matching process involves making sure the person and dog have the same preference for walking pace. Since Joe, a former San Diego City lifeguard, walks a brisk five miles a day, he requires a fast traveler with lots of endurance. Joe couldn’t be happier with the results of his newest match. Enya, “my little rocket dog,” is focused, intelligent, and precise, he said. One day Enya halted on a sidewalk in their hometown of La Jolla, California. Joe probed ahead with his foot and discovered hoses lay in their path. He encouraged Enya to continue over them, but she refused. Joe remembered the words of a Seeing Eye instructor: “Follow your dog!” Joe did. Enya turned them around and devised a new route that avoided the area. Good thing, too – Joe later discovered the hoses were hooked up to equipment on an active construction site! 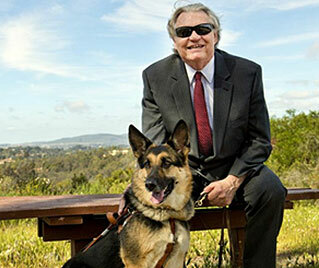 Joe estimates that in his more than 4 decades of partnerships with Seeing Eye dogs, he has walked more than 100,000 miles with his faithful dogs guiding him.